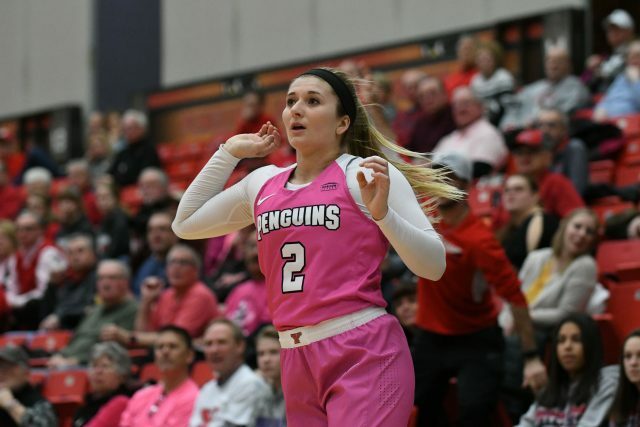 With their five-game homestand over, the Youngstown State University women’s basketball team takes to the road for two important Horizon League games. The Penguins travel to Indiana and Illinois for their next two matchups, taking on Indiana University-Purdue University Indianapolis and the University of Illinois-Chicago. YSU took down UIC 81-29 and beat IUPUI 70-52 in their prior matchups, but that doesn’t mean they have two free wins on the schedule. Road games are a much different atmosphere. In their most recent contest against the University of Detroit Mercy, the Penguins shot 60.7 percent from the field, their highest shooting percentage since 1998. That was aided by a red hot start by senior guard Alison Smolinski, who nailed her first five 3-point attempts in the first four minutes of their game. Smolinski was held scoreless in the game against Oakland University, but rebounded and rebounded hard, scoring 17 points in the first quarter against Detroit Mercy. In that game against Detroit Mercy, the team got off to a fast start opening with a 19-0 run. Barnes hopes to keep that train rolling against the Jaguars. One of the unsung heroes in the homestand was Amara Chikwe. She was outstanding on defense, bringing down 17 rebounds in the final two homestretch games. Despite going on the road, Chikwe’s mindset is staying the same. “It’s away, but we still have to have the same mindset, still have to execute our gameplan, play for each other and just do our thing,” Chikwe said. With the season winding down, the Horizon League tournament is on the horizon. The Penguins sit second in the conference with a 17-5 overall record and a 9-2 conference record, and this road test is coming at just the right time.